Pharmacists are having to adjust to even more new opioid laws that are being implemented in 2019. 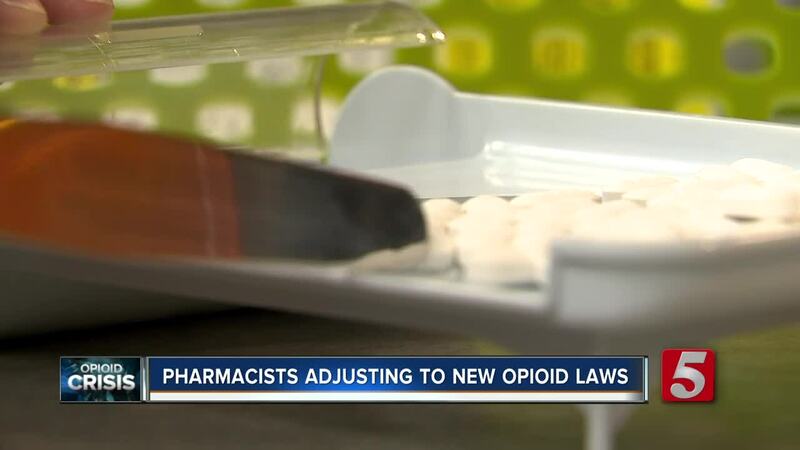 NASHVILLE, Tenn. (WTVF) — Pharmacists are having to adjust to even more new opioid laws that are being implemented in 2019. As of January, pharmacies are required to record prescriptions with a medical code to its system. The data will then be sent to the Controlled Substance Monitoring Database (CSMD) where state officials can keep track of what type of opioids and to whom are being prescribed. Micah Cost of the Tennessee Pharmacists Association said it has already been a struggle since pharmacists have been adjusting to previous prescription laws set in July. "We're still struggling with the implementation of it especially the partial-fill provisions," Cost told NewsChannel 5. Last year, healthcare practitioners may give an opioid prescription of up to three days with a 180 MME total dosage to patients in need of a small dosage. Depending on the condition, they can also prescribe opiates of up to 10 or 20 days but would require extra steps. It also would be a partial-fill prescription which meant patients would have to return to obtain the rest of their medication. Now that pharmacists are required to put the data about partial-fill prescriptions into a system, issues are popping up. Different software systems pharmacists use aren't able to handle the changes, according to Cost. "It's really an innovative concept and pharmacy software systems have the capability to do but not in the capacity the state is requiring right now," Cost said. "Some systems are not handling it, and some software systems say we're not going to comply and go with the lowest possible quantity and you'll have to go back to your doctor again." Cost said pharmacists are working around it manually but can cause a backup. To add on top of the problem, federal laws and certain insurance companies have their own prescription limits that conflict with state standards. "There are lot of different numbers and causing confusion in our healthcare community right now," Cost added. TPA members including the Dickson Apothecary have also been working around the changes. Dr. Leslie Shepard said the long-running, family-owned business is having to manually remove the code required by the state when sending prescription information to the pharmacy benefit manager. "Because of computer error, our system, them reading our data, they're rejecting and not allowing us to successfully submit what we are required to do by law in Tennessee," Shepard said. "We either don't submit it to that insurance or we remove the data that we are required by law to send in order to get a successful claim." Another change this year is requiring the state to establish and maintain a public toll-free telephone line and web-based hotline for people to report potential opioid abuse or diversion. Anyone who calls would be "immune from civil liability" in relation to the report. People can call 1-800-852-2187. Any entity that prescribes, dispenses or handles opioids is also required to have signage and provide information to employees about reporting suspected opioid abuse or diversion.